and Heart of the Cycling Boom of the "Gay 90's". Cycles were expensive. A top quality bicycle cost up to 50% of the annual salary of the average worker. Thus the early adopters of the bicycle were the upper economic class who generally had the better education. That education was usually in the Arts and Sciences, rather than trade schools, so cyclists were very familiar with Poetry and Arts. The Bicycle is characterized by many as “Inspiring” due to its ability to give a feeling of Personal Freedom. The bicycle also allows people to get into the fresh air and smell the lovely scents of nature and see the beautiful sites which are outside of our metropolitan centers. Cycling actually improves the participants physical health. Along with this, it also makes a participant more mentally alert and mentally active. There was a well developed Bicycle Journal industry reporting upon the New Bike Developments, New Technologies, Bike Racing, Bike Touring, and with extensive advertisements. With the love which participants develop (and it is Love) for the Bicycle, combined with their literary propensities and inspiration, it is natural that they would write poetry about their cycles and cycling. Weather – Since Cyclists are out in the weather, this very real aspect of the cycling experience is carried into the poetry, whether it be good weather or bad weather. Seasons – Similar to the weather, the seasons are fully felt by the cyclist. Thus this topic is appropriately recorded in the poetry. Road Conditions – Like the Seasons and the Weather, road conditions directly physically affect the cycling experience and worked strongly into the Victorian Cycling Legacy which was passed through the Journals. The LAW Journal was subtitled “Good Roads” as a Prime mission of the LAW was to lobby for road improvement. Nearly every issue had a Poem on Road Conditions. Advertising – The 1890s were like today, capitalism was in bloom and if someone could make a buck, they would. To make their bucks, they wrote advertising poems from simple to elaborate. Bicycle Racing – Where there are two men (or 2 women) who are riding there will often be a bit of competition … leading to racing. This led to formal races from the very beginning of cycling in the days of the Velocipede. This also led to Racing Poetry. 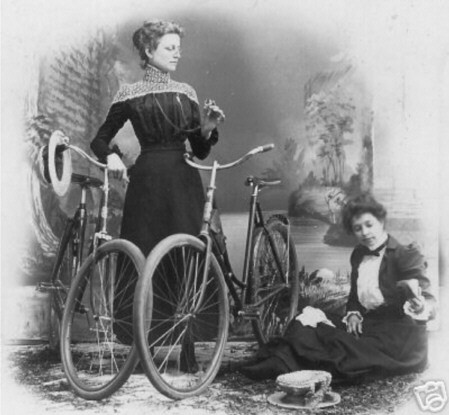 Rationalization of Women’s Clothing – To ride a Bicycle, an ankle length dress, corsets, and other constraining and restricting clothing, which was the standard for the period, were inappropriate or at least physically limiting. The liberation of the women’s clothing was recognised in the poetry. Women’s Liberation – As the clothing allowed women physical freedoms they had not had before, and the transportation capability allowed mobility previously unknown, the women developed a desire for other aspects of freedom including Sufferage and Equal Rights. This was also put into the poetry. Romance – With women getting out and showing a bit of arm and leg … and with the arms and legs being well toned and fitly attractive, the natural inclinations toward coupling were accented. The poetry reflected this with romantic themes. Tandem Cycles – Coupling by Bicycle is easier when you have a Bicycle Built for Two. Poetry of the days reflected this. Religion – Of course, as the defender of the established morality, the organized religions looked at the bicycle and it’s effects on women’s clothing/ women’s changed habits/ dating habits/ and other aspects of cycling and many, many churches had misgivings about the bicycle. The poetry discusses the Church’s often negative reactions. Ethnicity – With the World Champion Cyclist at the turn of the Century being Major Taylor, an African American, there were racial tensions on the cycling scene. This could not escape being manifested in the poetry. Getting Old (Retirement) – As all cyclists know, individual capabilities grow through training and practice until at some point they start to decline. While cycling is a non-destructive physical activity and in fact improves one’s health, eventually the calendar cannot be denied. Epic Ballads – Very long poems which tell a compelling Story of Cycling with real interest. Hazards – Cycling has risks … traffic, dogs, road conditions. Death – Either Bike Risk – or Cyclist afterlife. General JOY of the Bicycle – The bicycle was loved for all it did … and that love and Joy made its way into poetry without any other focus.